I observe separate "create" activity for performing create action. Can't we do it in the backing bean programatically?. It is possible to invoke Create programmatically from Backing bean. But, I would recommend, if it is only possible, to do it declaratively. I noticed in both examples(10g and 11g) that in order for the tutorials to work, the Managed Bean must be scoped as session level and request level. This can be very memory eating process. Image there are many pages in a web application. Is there a way to do this thing using the request scope instead of session scope??? Moreover, if there is a boolean value in the view, can it be bound to a check box ???????? I am trying to implement this for find operation and every time I am getting "Attempt to re-register component with different model." For the find Any pointers why? I have implemented the search functionality by following your guidelines in the blog and it is working fine if I don't have any bind variables for the query. We have a requirement in which the form can have only one record in the search criteria. 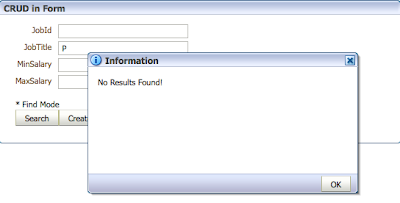 we have to fetch data based on the search criteria entered by the user (which is fine). We have to fetch the default data if the user does not enter the query criteria. How to implement this solution for our scenario. have can i prevent this action? I have written a blog on ADF 11g Crud operation and also its source code is available for download , can i post the link on your blog ? Sure, thanks for asking - post a link here. This blog article covers how ADF 11g can be used for CRUD Operations. Is it possible to create a form to insert a new record using only one submit button? Currently I add createInsert and Commit buttons from Data Controls' operations. I'd like to do that using just one button. Hi Andreus I have a similar functionality needed and downloaded your link but not sure how you did this. Any chance you could point me to a step by step tutorial or just guide me through it? private richform Form1 like you do. There is no need to create accessors for every component. You can go to component properties screen and find Binding property, it will be one of the last properties. Define binding name and it will generate accessor. In Red Samurai, we are offering advanced ADF coaching, drop me an email, if you are interested. It should work fine with Rollback operation and resetActionLister mapped to Undo button. The listener is mapped to the undo button and the action is the undo button method as defined in the main.java. From what I saw the action calls the rollback but the pop up still comes up. Does it work for you? I downloaded it from here, try doing that and then check if when you change something and then press undo, can you navigate without pressing save. I believe it was working as you describe. But, I will check today with latest release. Will let you know. You should add this code in undoButton_action function, first IF statement. Regarding EL expressions..., you cant user *.execute inside Rendered property. Because *.execute invokes action. Andrejus when I press create and insert data for a new row. I press commit and the data commits. I then press commit again (as a test see) and I get an error message in firefox, but there is nothing in Jdeveloper, no error message. What could be causing this? The message is quite long so I won't be posting it at this time but if you want me to I will. Hey Andrejus how did you hide your navigation buttons when you press create? Did you use rendered or some other property? You can contact me for Red Samurai advanced ADF training/coaching... We can help to speed up your project and make sure all on right track. Hi Andrejus, I'm faceing troubles when I'm using refresh Row.REFRESH_UNDO_CHANGES, The problem presents when I have a view object with a base entity object and other entity objects working as references ... the framework always raise a validation about need the required fields of the referenced entities, but I dont understand this behavior, because I create the entities as reference usage ... Could you help me? Can someone help me to implement createwithparameter operation in ADF ? There is a topic within ADF DataControls; Enabling Custom CRUD Operations in a Bean Data Control. Having gone through it I need some assistance; Have created a Simple class with Collection setter and getter. After creating datacontrol from it I was able to see all the operations. 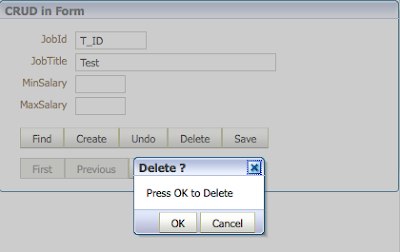 How can they be customized so as I can use jdbc to create and delete record from the database. Help with any sample will be highly welcomed. But how can download Sample Application. Google closed download service for very old sample apps. Sorry.